The three-star Hotel Conterie is operated by a family that has been making glass in Murano since the 1500s. It has 26 rooms, a private garden, and a pleasant location on a quiet street near the Basilica of Santi Maria e Donato and the Glass Museum. As you leave the boat platform, turn right. 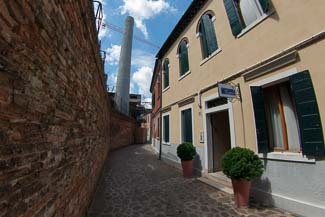 Follow the canalside pavement past the Museo del Vetro (Glass Museum) and the Basilica. Around the next bend, you'll see a grey stone bridge ahead of you. Turn left about a block before the bridge, into a street paved in flagstones. This will be the Calle de le Conterie. Walk down the Calle de le Conterie toward the smokestacks of a glass factory. The Hotel Conterie will be on your right, at No. 21. When you reach the Murano Museo waterbus stop, follow the directions above.